Updating the Brother printer driver is necessary to improve the essential functions of the device. The printer driver is a pre-structured program that lets you communicate with the printer. It converts the commands to the printed data. Use a driver that is compatible with the printer model and version of the operating system. The manufacturer releases the update periodically. The upgrades help to fix the system bugs and additional features. If the printer uses an outdated driver, it may result in a system crash. You can update the printer driver automatically and manually as well. Learn how to update the Brother printer driver using the steps below. How Should I Update The Brother Printer Driver On Windows 10? Use the Windows Update software to update the drivers automatically. Open the Windows Update software on your system. Select the Settings option displayed on the screen. Click Update & Security-> Windows Update-> Check for Updates. Available updates download and install automatically on your system. Make use of the Device Manager to update the driver. Click the Start option available on the Quick Launch bar. Type the Device Manager term in the search bar and then expand the category. Right-click on the device and choose the Update Driver option. Select the Search automatically for an updated driver software option. An updated version of the driver automatically downloads and installs in it. What Is The Procedure To Update The Brother Printer Driver For Mac? Step 1: If you are using a Mac system, updating the printer driver is carried out by uninstalling the currently used one and installing the new driver on the system. 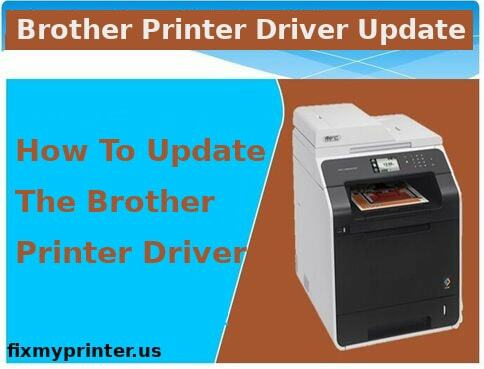 Read and follow the steps mentioned below to start the process of how to update the Brother printer driver. Step 2: Switch on the Brother printer by pressing the Power button. Unplug all the cables connected between the printer and the Mac. You need to log in to the system as Administrator. The login is necessary to uninstall the printer driver. Step 3: Choose the System Preferences option from the Apple menu. Select Print and Fax, Print & Scan or Printers and Scanners icon based on the options displayed. Choose the printer name from the list and press the – sign under the Printers section. Step 4: Drag the Brother folder to remove all the files on the system. Select the Go option under the Finder menu. Choose Computer-> Macintosh HD-> Library-> Printers-> Brother. All the files are moved to the Trash Bin and work forward on the process of how to update the Brother printer driver. Step 5: If you are unable to find the Mac icon on the desktop, select the Finder option on the screen. Click the Preferences tab. In the General tab, view the Hard disks tab. You need to end the Finder Preferences window. Now the Hard Drive icon displays on the desktop. Step 6: Locate the Go option. Click Go from the Finder bar. Select Computer-> Mac HD-> Library-> Printers->PPDs-> Contents-> Resources. Move all the files with gz extensions into the Trash bin. After emptying the bin, restart the Mac system. Step 7: To install the printer driver on your Mac system- Move to the Downloads option on your manufacturer’s website. Download the Full driver and software package option from the website. You can find the installation instructions present on the download page. Step 8: After downloading the driver, locate the setup file in the Downloads folder. Install the driver using the instructions on the screen. Turn on the Brother printer by pressing the Power button. Link the printer and the system using a USB cable. Step 9: Open the System Preferences option on your Mac by selecting the icon in its Deck. Choose the Printers and Scanners icon if the printer is displayed on its list. If the printer name is not enlisted, select the + sign located at the bottom of the printer. Step 10: Choose the Default tab in the window. Select the Use drop-down menu and choose the Select Software icon. The printer drivers are available that matches up to the driver list. Click the Add option to complete the installation and how to update the Brother printer driver.